2. A leashed dog may be used as an aid in locating and recovering wounded big game wildlife, except for black bears, with the purchase of an annual tracking permit. Tracking permits can be purchased for $40.00 from any Colorado Parks and Wildlife Office by the dog handler. Prior to using the permit, the dog handler must notify a Colorado Parks and Wildlife Office and provide the following information: the dog handler’s name, hunter’s name (if different than the handler), hunter’s CID number, location of use, species to recover, and time of use. Within five business days of using the permit, the handler must also notify the Division regarding whether they recovered the carcass. A dog may only be used to pursue or locate wounded big game during legal big game hunting hours. Provided however, that such pursuit may continue after legal big game hunting hours if the handler contacts and obtains the permission of a Wildlife Officer prior to continuing such pursuit. In acting on any such request, the Wildlife Officer shall consider the general public safety and may authorize the dispatch of the wounded animal after legal hunting hours. The dog must be leashed at all times and can not be used to kill, chase, or harass wildlife. 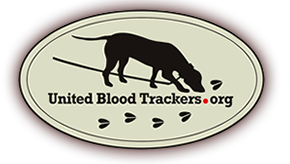 The properly licensed hunter is required to be present while the dog is tracking and the animal must be dispatched by the hunter using a legal method of take based on their license. The dog handler is required to wear daylight fluorescent orange or fluorescent pink while tracking, unless the handler is tracking an animal shot on an archery license.